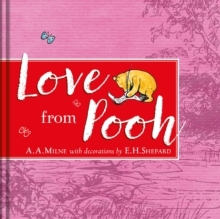 Wear your heart on your sleeve with this lovely gift book featuring words of love from Winnie-the-Pooh. When you are Pooh, honey is your first love, and your best friend loves you despite you being a Silly Old Bear. This book features original quotations from A.A. Milne's charming stories and poems, accompanied by E.H.Shepard's charming line illustrations:"Wherever I am there's always PoohThere's always Pooh and me. Whatever I do, he wants to do,"Where are you going today?" Says Pooh"Well that's very odd `cos I was too. "This little book is yours with love from Pooh.